All I can say is WOW! Amazing renovation! Discover the life you have promised your family. New roof in the last two years, HUGE YARD, with 600 sq ft concrete pad for all your toys, no HOA, septic and well (new pumps), so very low utilities, new A/C only 2 years old, electrical panel only 2 years old, totally fence 1/3 acre spread, like living in the country but close to everything! Low maintenance vinyl siding, Brand new stainless steel appliances, new cabinetry and lighting through out, new toilets, New granite counter tops in the kitchen, HUGE Master suite, HUGE Master closet, 2nd Master upstairs with loft and balcony. Two additional bedrooms and bath upstairs, 1/2 bath downstairs. Would be perfect arrangement for an in-law suite. All pictures are digitally staged. 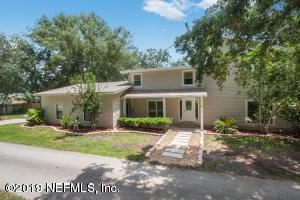 Listing courtesy of Jax Elite Realty.